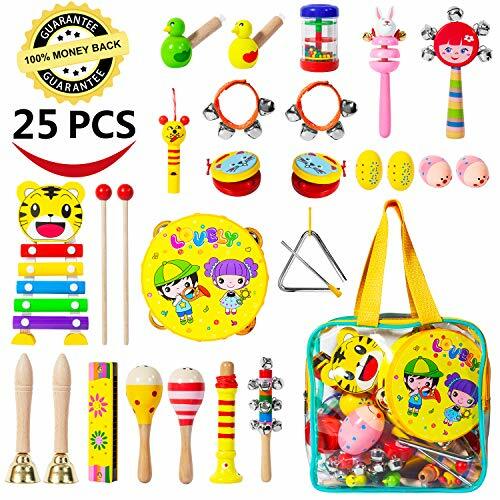 A perfect toy musical instruments for babies, toddlers, kids, the ideal gift for the little ones. When playing, kids should be under adult supervision to avoid injury playing with the Claves or Mallets, Strikers etc. ♬【Non-toxic and High Quality Materials】-- The musical instruments set are made of high quality non-toxic material (CPC Certified / ASTM Certified and FDA Approved). safe and reliable musical toys for young children. ♬【Carry Bag, Ideal Present for kids】-- Comes with a carry bag,making the gift looks higher level. It's more convenient to collect toys and easy to carry when going out. Kids get toys and music anywhere all the time. ♬【100% MONEY BACK & WARRANTY & ATTENTIONS】-- We promise 30 days for 100% MONEY BACK, 2 years WARRANTY return policy and 100% customer satisfied support! To ensure there is no safety hazard, children BELOW 3 please be accompanied by adults while playing.PLEASE NOTE THAT EGGS ARE A CHOKING HAZARD! If you have any questions about this product by TAIKER, contact us by completing and submitting the form below. If you are looking for a specif part number, please include it with your message.